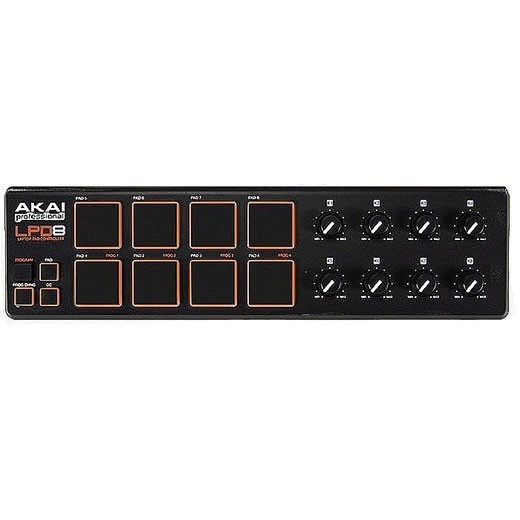 The Akai LPD8 USB is a ultra-portable production pad. The LPD8 laptop pad controller is a USB-MIDI controller for musicians, producers, DJs and other music creators. It measures less than 13" across and weighs less than a pound to easily fit into a laptop case, backpack or messenger bag for extreme portability. The LPD8 has 8 orange light-up pads that are velocity sensitive for programming rhythmic or melodic parts. The pads can also send program-change information to software. Additionally, the LPD8 has eight assignable Q-Link knobs you can assign to virtually any parameters in their software for hands-on control. The LPD8 works plug and play with Mac and PC and requires no software driver installation or wall power for operation. It has 4 memory banks for programming and recalling settings appropriate to different software programs you use.